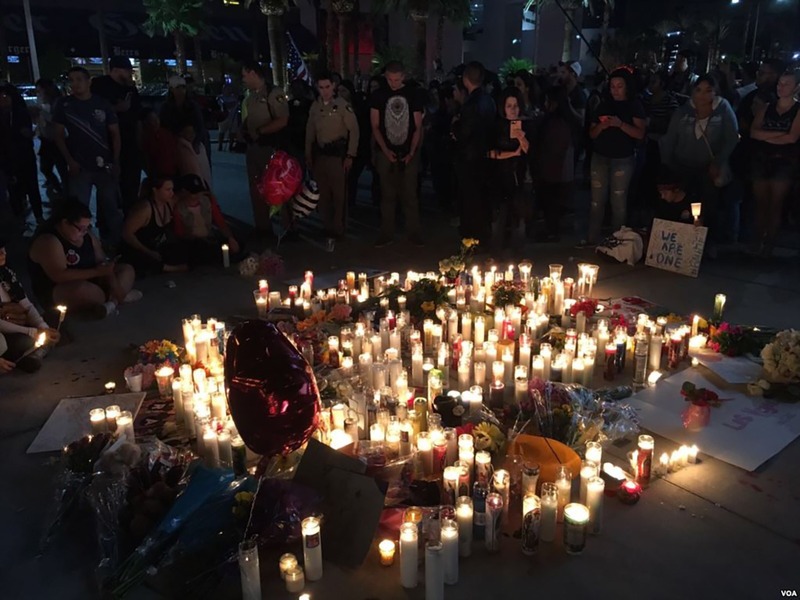 A candelight vigil for the victims of the 2017 Las Vegas shooting. On October 1, 2017, a lone gunman carried out the deadliest mass shooting in United States history, firing numerous weapons from a hotel window into a crowd of an estimated 22,000 people at an outdoor country music concert in Las Vegas. The shooter fired about 1,100 rounds in the span of just a few minutes, killing fifty-eight people and injuring approximately four hundred more. The shooter was able to discharge his weapon so quickly because his rifles were equipped with bump stocks — modifications that allow guns to fire bullets in rapid succession. Bump stocks allow shooters to fire hundreds of rounds per minute compared to traditional semi-automatic rifles, which, depending on the model, can have an effective firing rate of 45 rounds per minute. Using a typical semiautomatic weapon, a shooter must squeeze the trigger independently to fire a single bullet; multiple trigger pulls fire multiple bullets. With a bump stock, the back-and-forth recoil of the weapon propels the gun in a bumping motion into the shooter’s finger as he or she holds down the trigger, simulating the shooting speed of an automatic weapon. Bump stocks are one of several types of attachments meant to increase the firing rate of semiautomatic weapons. “Multiburst trigger activator” is a catch-all term, coined by the California State Legislature, to describe these gun attachments. Trigger cranks are another speed-firing attachment that also are included in this definition. A trigger crank is affixed to the trigger of a weapon that, when rotated, allows the user to fire rapidly using a “fishing reel” motion with the crank hitting the trigger multiple times per turn, firing multiple bullets. Prior to the Las Vegas shooting, California and Iowa were the only two states to ban bump stocks and similar gun attachments. California passed its ban on multiburst trigger activators in 1990, and, following the Las Vegas shooting, passed an amendment expressly including bump stocks in its definition of banned trigger activators. Iowa passed a similar law in 2011. Prompted by the Las Vegas attack, ten states then banned the use of bump stocks: Massachusetts (effective February 1, 2018); New Jersey (effective April 15, 2018); Rhode Island (effective June 1, 2018); Hawaii (effective July 9, 2018); Connecticut (effective October 1, 2018); Florida (effective October 1, 2018); Vermont (effective October 1, 2018); Delaware (effective January 1, 2019); Washington (effective July 1, 2019); and Maryland (October 1, 2019). 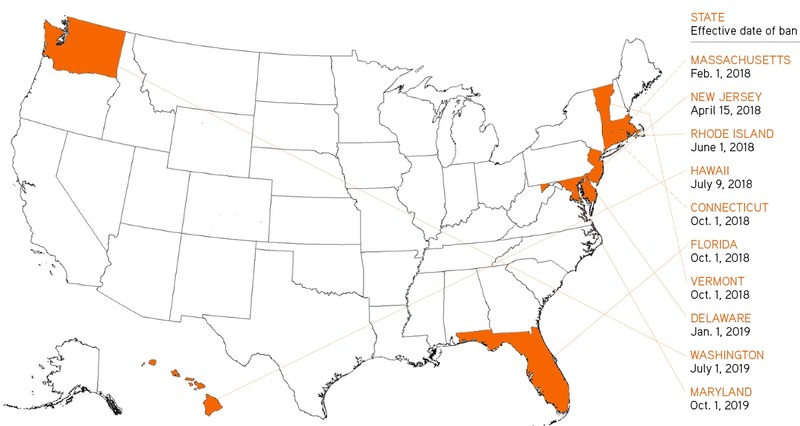 Among these states, Connecticut, Delaware, Massachusetts, New Jersey, and Rhode Island are members of the Rockefeller Institute’s Regional Gun Violence Research Consortium, a first-of-its-kind organization that seeks to develop data-driven policy recommendations to disrupt the cycle of gun violence in the United States. The consortium also includes New York and Puerto Rico. Several states took action to clarify their existing laws following the attack. For example, prior to 2017, Massachusetts had already restricted weapons that fire multiple rounds “by one continuous activation of the trigger,” including trigger cranks, but then clarified its law to specifically prohibit bump stocks. As of February 1, 2018, possession of bump stocks in Massachusetts was banned entirely, including possession within a private home. Notably, the law does not “grandfather in” previously purchased attachments, which means that all privately owned bump stocks, regardless of when they were purchased, must be turned over to law enforcement. Following Massachusetts’ lead, New Jersey took similar action several months later in April 2018. Hawaii expressly bans bump stocks, as well as trigger cranks, multiburst trigger activators, and any other attachment that simulates automatic firing. Owners of these attachments are not compensated for their financial loss when turning attachments in as required, nor are their attachments grandfathered in to allow for continued possession if purchased before the law was enacted. The bump stock bans in Vermont and Washington are slightly different. In these states, bump stocks are defined to include only “devices that simulate the firing speed of a fully automatic weapon.” This is distinct from other state laws that ban bump stocks entirely and without qualification. It is estimated that the Las Vegas gunman was able to fire nine rounds per second using his bump stock, slightly below the rate of many fully automatic weapons. Thus, his bump stock modification would not have been prohibited under the new Vermont and Washington laws. Penalties for violating these prohibitions vary from state to state, ranging from Massachusetts where first time violations are a felony with a sentence of up to 18 years to life in prison, to Delaware where first time offenses are misdemeanors and only subsequent offenses are felonies. Likewise, states varied the timeframe in which owners are granted to turn in bump stocks. Hawaii allows 30 days, whereas Washington allows one year. And some states, such as Iowa, ban only the sale of bump stocks, but not the purchase or possession of these modifications, so bump stock owners are not required to surrender these attachments. Some states do not clearly ban bump stocks, but do ban other firearm attachments. For example, Minnesota bans trigger cranks, and Michigan’s law bans all devices generally that “convert a semiautomatic firearm into a fully automatic firearm.” These and similar laws across the nation are likely to require judicial review in order to say definitively whether they apply to bump stocks. On December 17, 2018, New York Governor Andrew Cuomo announced his intention to ask the state legislature to pass a ban on bump stocks within the first 30 days of the upcoming session. Inconsistencies across states mean that judicial or administrative interpretation may define what is to be accepted as bump stock modifications. An additional challenge has been the difficulty some states have had in enforcing these laws. While New York’s existing gun control laws are written with the intent of restricting weapons that can simulate the firing power and action of machine guns, they do not specifically ban bump stocks. According to Ari Freilich, a staff attorney with the Law Center to Prevent Gun Violence, this likely means that it is illegal to attach a bump stock to a rifle, but that it likely is permissible to sell or manufacture bump stocks in the state. Thus, although the plastic attachments can still be manufactured and purchased, they become illegal when a user attaches them to a weapon. Other states with similar issues and the resulting confusion have modified their laws to expressly ban bump stocks. Inconsistencies across states mean that judicial or administrative interpretation may define what is to be accepted as bump stock modifications. An additional challenge has been the difficulty some states have had in enforcing these laws. A few months after the deadline passed for New Jersey residents to turn in their bump stocks, for example, not one had been turned in to local authorities. In Massachusetts, authorities have received only three bump stocks since that state’s deadline passed. While it is not known exactly how many bump stocks are owned in these two states, it is reasonable to speculate that it is more than zero or three, respectively. The effectiveness of these new state laws obviously is tied to the ability to implement and enforce them according to the intent of the law. On December 18, 2018, President Trump proposed that the U.S. Department of Justice amend regulations at the Bureau of Alcohol, Tobacco, Firearms and Explosives (ATF) to classify bump stocks as “machine guns” under the National Firearms Act of 1934 and amendments to the Gun Control Act of 1968, rendering them illegal under federal law. This action is characterized as a final rule, or a regulation initiated by the President with advice from an executive agency. While this rule was being proposed, the ATF received approximately 186,000 public comments, of which 64 percent were in support. Under the final rule, bump stock owners have ninety days to destroy their devices or hand them over to an ATF field office. Opponents of the President’s action categorize it as both unconstitutional, since the rulemaking will bypass Congress and its law-making duties, and illogical in the sense that a piece of plastic, i.e. the bump stock, can by itself be considered a machine gun. A modified stock, they argue, is not the same as an automatic weapon. The belief that banning bump stocks is a “slippery slope” further undermines support among gun owners. Proponents, on the other hand, argue that the rule does not go far enough in addressing gun violence, in part because the vast majority of mass shootings did not involve bump stocks. Banning bump stocks and similar attachments, of course, will not address all gun violence issues. But just as evident is that such prohibitions will reduce the tools available to those who wish to carry out mass shootings. In implementing the rule change, the federal government should take heed of the difficulties states have encountered in implementing and enforcing their own prohibitions. Based on research from the Brookings Institution, it is possible such difficulties stem from problems with a lack of resources to properly implement these new bans, as well as insufficient incentives for compliance because not all states offer buy-back programs or other similar approaches. Federal prohibition of bump stocks will offer a foundation of consistency to states, where many individual actions have resulted in a varied patchwork of rules and processes. The federal action is facing legal challenges, however. The organization Gun Owners of America has filed suit against the ATF to block the prohibition, citing what is claimed to be the rule’s unconstitutional nature. Without congressional action, Trump’s final rule, originally meant to circumnavigate the legislature, could prove ineffective. An additional complication may be that the Department of Justice (DOJ) initially stated that Congress needed to act on bump stocks, not the President. But DOJ changed its tune when President Trump mandated that the agency find an executive solution instead. Implementation woes have hindered states’ attempts to effectively address the bump stock issue. If New York intends to ban bump stocks it should prioritize a law and regulations that guarantee successful implementation, because the federal rule, without concurrent congressional action, may not stand for long.